The Seven Sins have come to Earth to do battle for the planet’s fate. 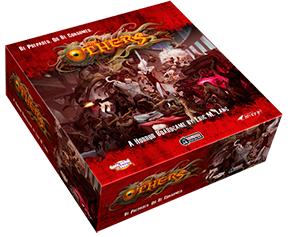 Another huge box o’ plastic from a CMON Kickstarter, The Others: 7 Sins, like Blood Rage before it, has the distinction of having being designed by game-designer-rockstar Eric M. Lang. So you’re in pretty safe hands. It’s an entertaining variation on the usual dungeoncrawling themes, only this time it’s a near future English city being overrun by horrific Hell-beasties aligned to each of the Seven Deadly Sins. An excellent excuse to let miniature designer extraordinaire and expert sculptor of mangled mutating flesh (and bumcracks – there’s a lot of bumcracks on these monsters), Mike McVey, run riot. Throw in ex-Games Workshop artist Adrian Smith, among others, and you have some impressive talent working on this design. And CMON delivered the goods and a huge amount of value for your Kickstarter gaming dollar: there’s enough miniature painting here to last me until the actual apocalypse. When big publishers are charging US$100 for a pretty standard game these days, CMON is impressively putting them to shame. But again, what’s with the unnecessarily double-barrelled names? I beg you CMON, just choose one and roll with it! Thank you for the great summary! Do you have a printer friendly version without the brown background? Thank you very much!